The FBI’s coordinated operation targeting opioid trafficking on the Dark Web -- or darknet -- culminated in 61 arrests, the agency announced Tuesday, after members of a government-wide coalition conducted a series of joint operations to disrupt the "most prolific opioid vendors on the Darknet." The operation, dubbed Operation SaboTor, is the Joint Criminal Opioid and Darknet Enforcement (J-CODE) team’s second law enforcement campaign to combat the opioid epidemic on a global scale and dismantle the criminal entities behind opioid trafficking. "Law enforcement is most effective when we work together, and J-CODE is the global tip of the spear in the fight against online opioid trafficking," FBI Director Christopher Wray said in a statement. "Operation SaboTor demonstrates not only the strength of our partnerships across the U.S. government and abroad but how we’re able to capitalize on those partnerships to disrupt criminal activity, even when they try to hide it on the Darknet." 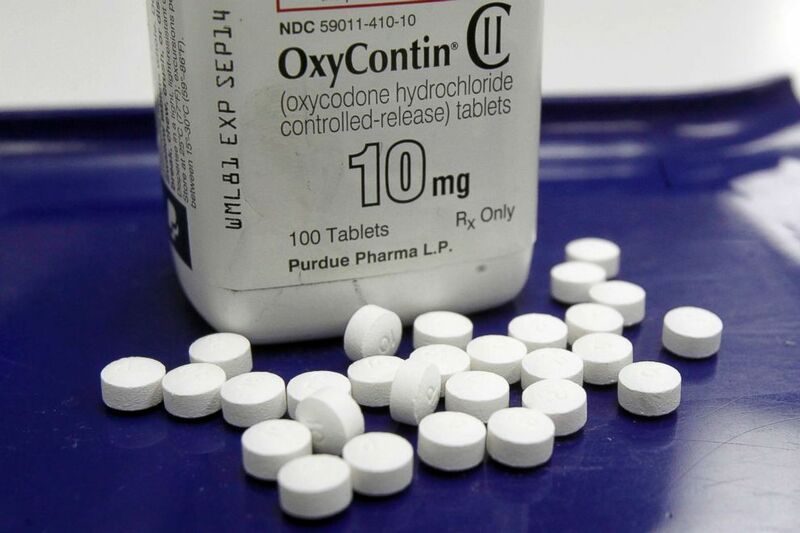 OxyContin pills and a bottle are arranged for a photo at a pharmacy in Montpelier, Vt., Feb. 19, 2013. Collaborating across a collection of agencies, all under J-CODE, the operation aims to target one of the deadliest epidemics in the nation. The Darkweb is not as dark as you think. Drug overdose deaths in the country are continually rising with 70,237 drug overdose deaths occurring in the United States in 2017, according to the Centers for Disease Control and Prevention. Among those deaths, 47,600 or about 68 percent involved opioids. One of the key channels fueling the epidemic is a network of narcotics traffickers online -- but through a multi-agency approach, the nexus of government agencies say they seek to meet those evolving threats by "targeting the marketplaces and the sellers to reaching out to those buying illegal wares online," according to the release. "Drug traffickers will be held accountable for the pain and death they cause, regardless of what technology they use," said DEA Acting Administrator Uttam Dhillon. But after securing 65 search warrants and conducting 122 interviews, the coalition of U.S. and international law enforcement agencies secured 61 arrests, shut down 50 darknet accounts used for illegal activity, seized 299.5 kilograms of drugs, 51 firearms, and more than $7 million ($4.5 million in cryptocurrency, $2.48 million in cash, and $40,000 in gold), the release said. Operation SaboTor comprised of a series of “separate but complementary joint operations,” the release said, and began in January and ended earlier this month. The various entities involved include the FBI, the Drug Enforcement Administration, U.S. Immigration and Customs Enforcement Homeland Security Investigations, U.S. Customs and Border Protection, United States Postal Inspection Service, the Justice Department and the Department of Defense, coupled with international partners during the Cyber Patrol Action Week at Europol. "The Darkweb is not as dark as you think," said Europol Executive Director Catherine De Bolle. "When you buy or sell illegal goods online, you are not hidden from law enforcement and you are putting yourself in danger."